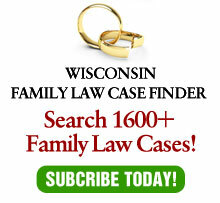 The only Wisconsin court of appeals case in family law this past week dealt with an arbitrated divorce case. More interesting, although of little precedence value, are the attorney fees incurred in the case. The case is not recommended for publication, but can cited for any persuasive value. In Symdon v. Symdon, the court of appeals affirmed an arbitration agreement, and the trial court’s denial of certain post judgment matters. Ron and Peggy Symdon went through a combined total of five lawyers and 335 separate entries on CCAP. For the most part, the case is of little interest as the court spends much of its opinion spanking the husband’s lawyer for doing a lousy job preserving the record and utilizing the correct standards on appeal. The milder criticism calls the attorney’s arguments “undeveloped or underdeveloped.” Other times, the court calls his arguments “generally disorganized and difficult to follow.” Most of the issues in the 26 page appellate decision are dismissed on those bases. What is surprising in the case is that amount of attorney fees involved. In the case, Ron was ordered to contribute $70,000 to Peggy’s attorney fees. This is a shocking amount as it is rare in Wisconsin for one party to have to pay the any of the other’s attorney fees, much less that much. Then, Ron was ordered to pay an additional $25,000 in attorney fees for Peggy to defend herself in the appellate action. Both of these orders were affirmed on appeal, again, mostly due to Ron’s failure (or his lawyer’s failure) to properly argue the issue on appeal. As shocking as these amounts are, CCAP reflects that the $95,000 contribution was merely a down payment. Ron’s own lawyers (yes, those same lawyers who did such a poor job on appeal) took a judgment against him for $218,390. If my arithmetic is correct, including what he owes Peggy’s lawyers, his total attorney bills are over $300,000. That is amazing. Plus, according again to CCAP, Peggy’s lawyers took a judgment against her for $220,000. So, the total attorney fees in this matter are close to a half of a million dollars. Little wonder, then, that CCAP also references a bankruptcy filing by Ron, although the contribution to Peggy’s fees may be in the nature of support and therefore non-dischargeable. Not having any independent knowledge of the parties or the case, I have no idea why the fees reached such astronomical amounts. Suffice to say that, fortunately, these types of fees are extremely rare. If I learn more about the circumstances, I’ll post it. It must have a quite a back story.